Here, H.-G. Schmalz and T. Wirth have put together a collection of current contributions on the most important topics in organic chemistry all in one handy book. Like its successful predecessors, this volume provides readers with numerous articles on the current state of synthetic methods and their applications. The wide range covered by nearly forty contributions ensures a concise overview of the latest developments in the field, whether they be new methods of C-C bond formation or racemization, asymmetric phase-transfer catalysis or stereoselective metathesis reactions, solid phase reactions or particularly elegant syntheses of challenging natural products. Throughout, the highly renowned authors guarantee the exceptionally high quality of the articles, making this an indispensable read for everyone wanting to stay abreast of developments in organic chemistry. 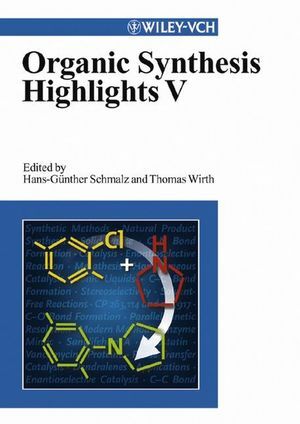 Hans-Günther Schmalz is the editor of Organic Synthesis Highlights V, published by Wiley. Thomas Wirth is Professor of Organic Chemistry at Cardiff University, Wales, UK. After a postdoctoral stay with Kaoru Fuji at Kyoto University as a JSPS fellow, he started his independent research in the group of Bernd Giese.